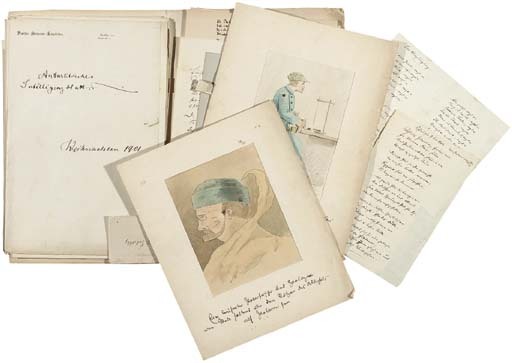 TELEGRAMS AND LETTERS: 5 telegrams sending congratulations to Drygalski and the crew of Gauß on their return, including one from Kaiser Wilhelm II sending his 'kaiserlichen Gruß', others from Sven Hedin and Ferdinand von Richthofen, and one telegram from Drygalski to Richthofen; a letter left for Drygalski at the Îles Kerguelen by members of the meteorological detachment of the German South Polar Expedition, signed by Enzensperger, Lunken and Menhaus, Drei-Insel-Hafen, 9 November 1901, informing Drygalski that they are proceeding to Observatory Bay; 2 envelopes with embossed crest of Deutsche Südpolar Expedition; a group of eleven autograph letters, postcards and notes signed by Erich von Drygalski, the majority to members of his family, 1929-1943; and 57 postcards addressed to Drygalski, and one other. The poems and sketches are redolent of the schoolboyish humour and intellectual ingenuities of the Antarctic winter, with prose pieces sending imaginary postcards home, laying down 'Golden Rules: a few important rules to follow on the journey to the South Pole', or providing a mock-bibliography of members of the expedition, and poems entitled 'A penguin on the ice', 'Experiences of a penguin', 'A Kerguelen Adventure' (to be sung to the tune of 'Tannenbaum', or sending up expedition members. After reaching the Îles Kerguelen on 1 January 1902, where they established a magnetic and meteorological station, Erich von Drygalski's German South Polar Expedition entered the pack ice and on 21 February, the day they sighted land (now the Wilhelm II Coast), became stuck. The Gauß was only the second ship to winter in the pack ice, and remained stuck fast until 8 February 1903; they returned to Kiel on 24 November of the same year. Though overshadowed by Scott's more celebrated expedition of the same year, Drygalski carried out much valuable scientific work, the publication of which was to occupy him until 1931. The Gauß was splendidly well-equipped for the Antarctic winter, with an atmosphere said to have resembled that of a cosily snowbound German hamlet.